EYE CATCHING. POWERFUL. AIR COOLED. Enjoy the confident feel of a boxer with an upright and relaxed riding position, coupled with modern technology. Choose from countless customizing options for your own unique ideas. The R nineT Urban G/S makes a clear statement: It pays tribute to the early days of BMW Motorrad’s G/S success story. Just one look and it’s clear that the R nineT Urban G/S captures the off-road spirit of that era. At the same time, its riding characteristics make it a true member of today’s R nineT family. It reflects the way of life of that time: People knew where they wanted to go, and they knew exactly how they would get there. The design of the R nineT Urban G/S is eye-catching. Distinctive stylistic elements make it a powerful, robust bike that pays tribute to the original G/S design: the 19-inch front wheel, the telescopic fork with the familiar bellows, the headlamp mask with the windscreen and the raised front-wheel cover define the front of the bike. The profile is defined by a pronounced horizontal line. White body elements and the narrow, slightly longer red seat revive the spirit of the legendary R 80 G/S from 1980. The black engine and frame highlight this effect. The new classic round instruments also show that the Urban G/S is part of the R nineT family. 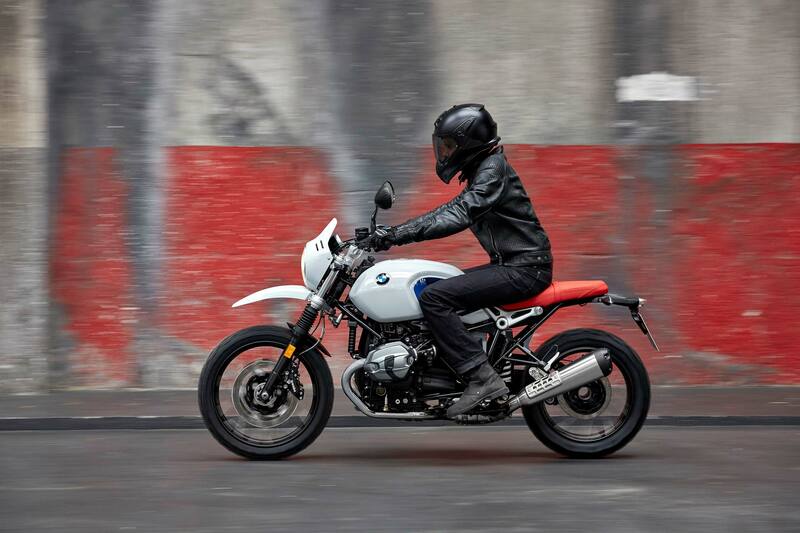 The R nineT Urban G/S also excels on everything from unpaved paths to gravel roads. The optional knubby tires and spoked wheels, the Enduro foot pegs, the bolted-on heat shield and the steel footbrake lever emphasize the effect, both functionally and visually. The balanced ergonomic triangle of the Urban G/S keeps you agile and confident on the road: The slightly higher handlebar, the long seat surface and slightly deeper and wider rear mounted footrests make for a more relaxed and confident riding experience. The standard seat height of the series is 33.5”. Thanks to an optional lower seat, the R nineT Urban G/S offers stability for riders of almost all sizes. When it comes to customizing, the possibilities are almost endless, as showcased so well in countless adventures throughout G/S history. The R nineT Urban G/S can be quickly converted into a one-seater thanks to the removable pillion frame. There’s also a tailored range of Original BMW Motorrad accessories to choose from. Options include a crash bar, engine guard or protective headlamp grille. The bike also comes with several optional accessories, including spoked wheels, various tanks, ASC (Automatic Stability Control), heated grips or LED turn indicators. But the R nineT Urban G/S is also ideal for installing specially fabricated add-on components such as our new Machined parts. In short: Your individuality is just as unrestricted as your riding pleasure. The new R nineT and R nineT Urban G/S: refined roadster with boutique manufacturing character and boxer feeling in a classic enduro outfit. When BMW Motorrad launched the R nineT in 2013, it was clearly more than just a roadster based on a classic role model. From the outset, the R nineT combined classic motorcycle design and modern technology with sophisticated craftsmanship, as demonstrated by the aluminium fuel tank with brushed side surfaces, for example. In numerous components, the model also reflected the R nineT team’s fond attention to detail. The new R nineT likewise radiates this boutique manufacturing character, supported by a range of optimised features. The new R nineT Urban G/S is quite different in style but equally classic in character. For more than 35 years, the abbreviation GS in conjunction with BMW Motorrad is been virtually synonymous with a sense of freedom and the passion for adventure on two wheels, both on-road and off-road. The R nineT Urban G/S draws on the genes of the very first and legendary BMW R 80 G/S of the year 1980, transporting them into the modern era with contemporary technology in the form of a classic enduro-style BMW motorcycle with boxer engine. Both of the new BMW Heritage models feature the potent, air/oil-cooled boxer engine with a capacity of 1 170 cc and an output of 81 kW (110 hp) combined with a 6-speed gearbox. The two variants are both designed to meet the requirements of the EU4 pollutant class. Their exhaust systems in stainless steel with the tailpipe positioned on the left reflects classic styling. Modular frame concepts with individual scope for customising. Modular frame concepts provide great scope for altering the appearance and character of the two BMW boxer models according to individual preference, for example by adding different seats from the range of BMW Motorrad accessories. In the R nineT, the frame comprises four components as before: a front main frame, a rear main frame, a removable end piece and a detachable passenger frame. In the R nineT Urban G/S the frame consists of three components: a front and rear main frame with integrated end piece and a passenger frame. R nineT now with fully adjustable upside-down fork and optimised suspension geometry. R nineT Urban G/S with suspension in enduro style. As before, a high-quality upside-down telescopic fork takes care of front wheel control in the new R nineT, though this is now designed as a fully adjustable component. With a view to even greater steering precision, directional stability and cornering neutrality, the new edition of the R nineT has also been optimised in terms of suspension geometry. In the R nineT Urban G/S there is a conventional telescopic fork at the front while the BMW Paralever is applied in conjunction with a central spring strut at the rear, as in the R nineT. The R nineT now has wired-spoke wheels in the dimensions 3.5 x 17 inches and 5.5 x 17 inches respectively, with tyres in the sizes 120/70 ZR 17 at the front and 180/55 ZR 17. As before, radially mounted 4-piston monoblock brake calipers ensure sound, ABS-regulated deceleration in conjunction with floating brake discs. The R nineT Urban G/S is supplied with light alloy cast wheels. The large 19‑inch front wheel with 120/70 ZR 19 tyre is in keeping with the typical enduro-style look of a classic bike. This is matched perfectly at the rear with a 17-inch wheel bearing a 170/60 ZR 17 tyre. The new BMW boxer can be ordered ex works with the optional extra of deep-treaded off-road tyres which further enhances its classic style (standard trim: road tyres) and also with filigree wired-spoke wheels. With 4-piston brake calipers, steel-wrapped brake lines and a brake disc diameter of 320 millimetres, a high-performance ABS brake system here again ensures effective and stable deceleration. In order to prevent the rear wheel from spinning on slippery roads, there is the option of ASC (Automatic Stability Control) which is available ex works. The new R nineT: purist roadster with boutique manufacturing character and the option of individual colours ex works. In its new edition, the R nineT once more features the laid-back elegance and proportions of a classic BMW roadster. From all angles, the R nineT is defined by a blend of classic and modern elements of motorcycle design style combined with high-quality surfaces. 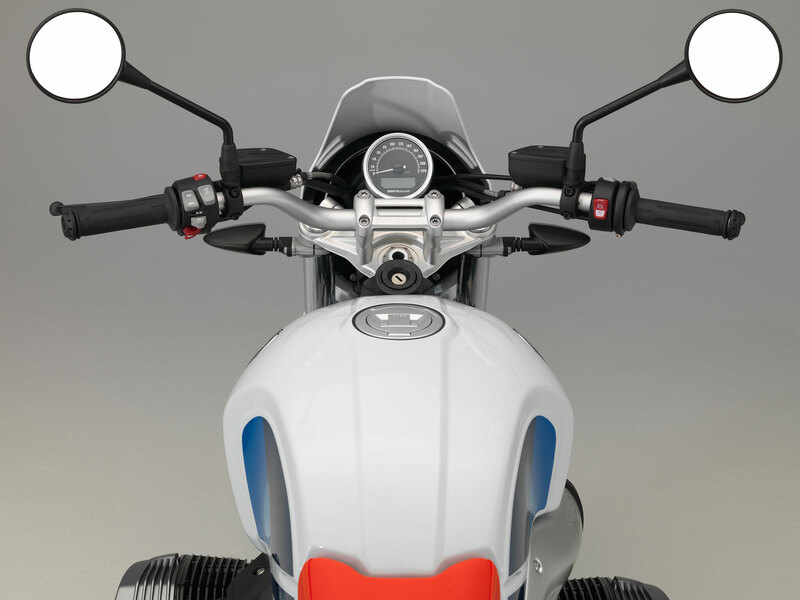 While the instrument cluster of the R nineT previously comprised two circular instruments for speedometer and engine speed display, perfectly integrated in the classic layout, the new design now features two separate instrument casings for an even more impressive appearance. Nothing has changed in the new edition of the R nineT in terms of its boutique manufacturing character and there are numerous details which fans will love: these include the 18-litre aluminium fuel tank with elaborately brushed side surfaces, the aluminium trim panel featuring an embossed R nineT inscription which runs across the air intake duct on the right-hand side and much more besides. While the R nineT conveyed its classic character in virtually perfect style with Blackstorm metallic combined with silver and metallic contrasts, the new R nineT nonetheless manages to go one better in this regard: to match the black-coated components such as the frame and engine housing, the Paralever swinging arm and the housing of the rear-wheel drive are now also finished in black. For the first time, two individual paint finishes with boutique manufacturing character are available for the R nineT ex works as optional equipment items. In this way, BMW Motorrad has expanded the customising range to include the area of paintwork for the first time. The special paint finish “Blackstorm metallic / Vintage” underscores the boutique manufacturing character of the aluminium fuel tank in Blackstorm metallic / silver with a yellow application bearing the start number “21”. The latter is applied by hand and gives the bike a refined used look. The model is supplied with an aluminium hump seat and passenger pad. The second special paint finish “Blueplanet metallic / Aluminium” emphasises the classically refined character of the R nineT with a touch of fresh style. Based on the clear-finished aluminium fuel tank with ground weld seam and aluminium hump seat – both hand-brushed – the centre section of the fuel tank and hump are finished in Blueplanet metallic with a golden surround. The colour Blueplanet metallic is also to be found on the front mudguard. R nineT Urban G/S: traditional colouring and styling in the style of the first BMW R 80 G/S. A look at the R nineT Urban G/S reveals it to be the spitting image of its ancestor, and it even reproduces the latter’s colour concept virtually without alteration. Just like more than 35 years ago, the fuel tank and the high-positioned front mudguard are finished in striking Lightwhite non-metallic, with a matching headlamp mask whose styling is geared entirely towards the BMW G/S style of that era. As before, the R nineT Urban G/S features fuel tank decor in two tones of blue and a two-man seat in bright red – a colour combination that interprets the BMW Motorsport colours of former years. This echoing of past times is supported by a frame finished in black. • Potent flat-twin boxer engine with a capacity of 1 170 cc and an output of 81 kW (110 hp) that meets EU4 requirements. • Modular frame concepts with scope for customising, allowing individualisation according to personal taste. • R nineT with new wired-spoke wheels. • R nineT Urban G/S with light alloy cast wheels and 19-inch front wheel in enduro style. • 320-millimetre twin disc brake at the front. • ASC (Automatic Stability Control) as an ex works option. • High-end details such as fork bridges made of forged aluminium with a clear anodised finish. • R nineT in classic roadster design in Blackstorm metallic in conjunction with a black frame and drivetrain. • R nineT Urban G/S in the enduro style of the first R 80 G/S dating back to the year 1980. 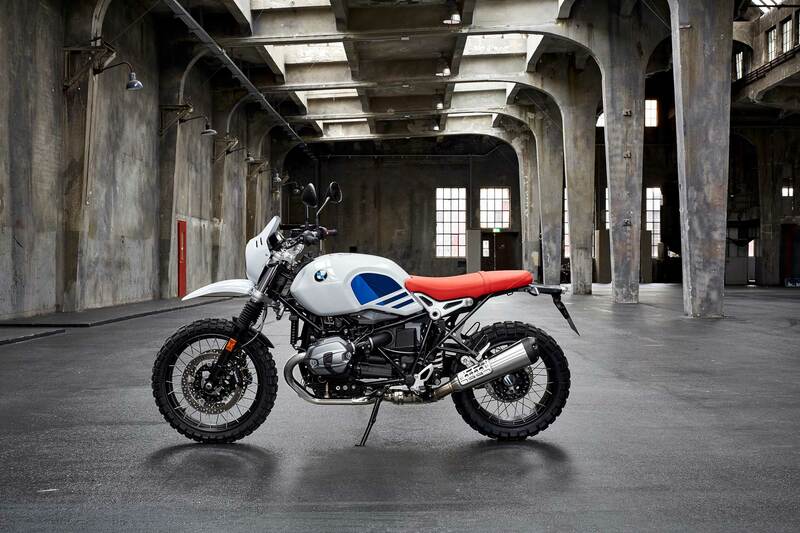 • R nineT Urban G/S in Lightwhite non-metallic combined with fuel tank decor in two blue tones with a bright red seat – echoing BMW Motorsport colours of past years. Distinctive, air-cooled boxer engine for classic motorcycle enjoyment and dynamic riding fun. The longitudinally mounted 2-cylinder boxer engine with power transmission via universal-shaft drive has been synonymous with BMW motorcycles for more than 90 years. Like no other motorcycle engine, the air-cooled BMW Motorrad boxer power unit enthrals riders with its unmistakable and authentic design, its powerful torque and its unique, throaty sound. The BMW R nineT and the R nineT Urban G/Se both feature the familiar air/oil-cooled boxer engine with 101-millimetre bore and 73-millimetre stroke, creating a capacity of 1 170 cc. Its peak output is 81 kW (110 hp) at 7 750 rpm and the maximum torque of 116 Nm goes on stream at 6 000 rpm, with a maximum engine speed of 8 500 rpm. Both new models of the BMW Motorrad Heritage world of experience have been designed to meet the requirements of the EU4 pollutant class. This involved fitting the motorcycles with such features as a new engine mapping, a fuel system with carbon canister for fuel tank ventilation and an exhaust system with an altered catalytic converter that has a larger cross-section. Control of the four valves is via two overhead chain-driven camshafts (DOHC) per cylinder. Valve activation is taken care of by very light and therefore speed-resistant rocker arms, and valve clearance compensation is by means of light hemispherical shims. Power transmission to the rear wheel is via the well-established 6-speed gearbox and the universal-shaft drive. Individually designed exhaust systems for a powerful boxer sound and an authentic look. The exhaust systems in stainless steel, each with rear silencer on the lefthand side, likewise contribute to creating a classic BMW with air-cooled boxer engine in the roadster and enduro style respectively. 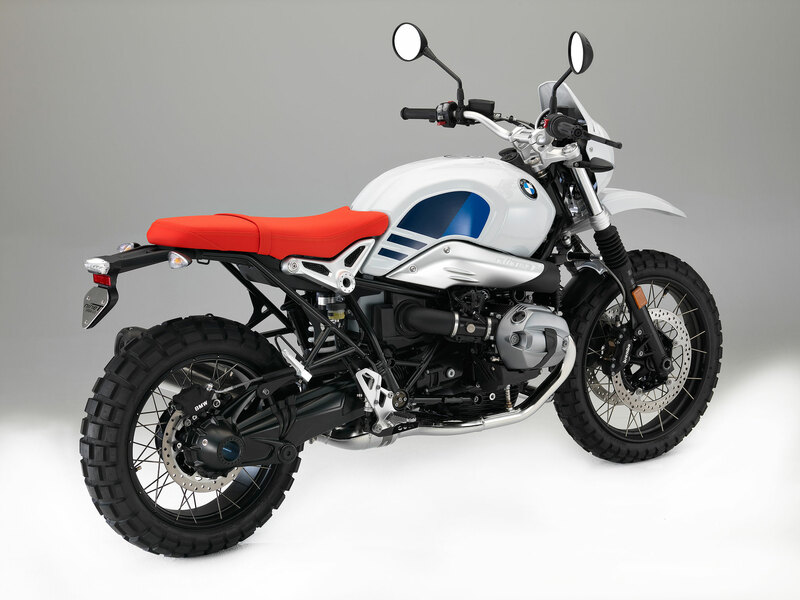 While the new R nineT interprets the concept of a classic, sporty roadster with rear silencers arranged vertically, the snugly fitting rear silencer of the R nineT Urban G/S reflects the philosophy of the original GS as a masterly, authentic variation on the BMW boxer theme for light off-road use. The exhaust system has an electric servomotor and an acoustic valve controlled by opening and closing cables so as to meet the desire for a sonorous boxer sound while still complying with the noise emissions directive ECE R41-04. What is more, a large-size catalytic converter ensures even more effective exhaust gas cleaning. The range of Original BMW Motorrad Accessories also gives customers various individualisation exhaust system options so as to be able to adapt the character of the two R nineT Heritage variants entirely according to personal taste. Modular frame concepts with wide-ranging variation options. The new R nineT and R nineT Urban G/S also respond to the desire on the part of many motorcycle fans to be able to make technical and visual modifications – commonly known as customising – by providing a steel tubular space frame concept. In the R nineT the latter comprises four components as before: a front main frame, a rear main frame, a removable end piece and a detachable passenger frame. In the R nineT Urban G/S the frame consists of three components: a front and rear main frame with integrated end piece and a passenger frame. The frame components are bolted onto one another. R nineT now with optimised suspension geometry and fully adjustable upside-down telescopic fork. With a view to even greater steering precision, directional stability and cornering neutrality, the new edition of the R nineT has also been optimised in terms of suspension geometry. 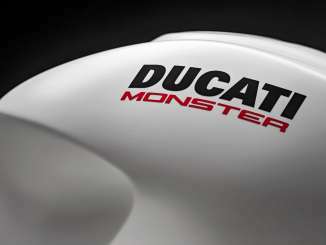 The wheelbase is now 8 millimetres longer at 1 487 millimetres and the steering head angle has been reduced from 64.5 degrees to 63.2 degrees. This also brings about an extension of the castor from 102.5 to 107.9 millimetres. As before, front wheel suspension is taken care of in the new R nineT by a high-quality upside-down telescopic fork borrowed from the supersports model S 1000 RR, but it has now been designed as a fully adjustable component with configurable damping compression and rebound stage as well as an adjustable spring rest, thereby enabling the suspension set-up to be geared even more precisely to the rider’s individual preferences. The spring travel is 120 millimetres. R nineT Urban G/S with classic telescopic fork and gaiters. In keeping with the style of a classic enduro bike, a conventionally structured telescopic fork with a tube diameter of 43 millimetres and a spring travel of 125 millimetres performs the function of front wheel control in the R nineT Urban G/S. As was common in enduro models in the past, classic rubber gaiters protect the exposed, sensitive slide areas of the fork tubes from stone impact. Well-proven rear suspension by means of Paralever. The functions of rear wheel control in the new representatives of the BMW Motorrad Heritage world of experience are performed in well-proven fashion by the Paralever single-sided swinging arm, as is also used in the other BMW Motorrad Heritage models. Suspension and damping functions are taken care of by a central spring strut with a spring finished in white in each case. The spring rest is adjustable and rebound-stage damping can be set to continuously variable levels. In the new R nineT the spring travel is 120 millimetres, in the R nineT Urban G/S it is 140 millimetres with a view to possible use in light terrain. R nineT with new wired-spoke wheels as well as new handbrake and clutch controls. the back of the R nineT a tyre of the size 180/55 ZR 17 is mounted. been changed. At the rear, deceleration is ensured by a single-disc brake with a diameter of 265 millimetres and a 2-piston floating caliper. Like all BMW motorcycles, the new R nineT is fitted with BMW Motorrad ABS as standard, and the option ASC (Automatic Stability Control) is now also available as an ex works option. R nineT Urban G/S with light alloy cast wheels and coarsely toothed footrests for a rustic enduro style. The R nineT Urban G/S is supplied with light alloy cast wheels. The large 19-inch front wheel with 120/70 ZR 19 tyre is in keeping with the typical look of a classic bike in enduro style. This is matched perfectly at the rear with a 17-inch wheel bearing a tyre of the size 170/60 ZR 17. The new BMW boxer can be ordered ex works with the optional extra of deep-treaded off-road tyres which further enhances its classic style (standard trim: road tyres) and with filigree wired-spoke wheels. high-performance and stable deceleration even when travelling at speed. At the rear there is a single-disc brake with a diameter of 265 millimetres and a 2-piston floating caliper. The R nineT Urban G/S is likewise fitted as standard with the BMW Motorrad ABS. This R nineT variant also offers the option of ASC (Automatic Stability Control) ex works so as to prevent the rear wheel from spinning on slippery roads. The new R nineT: purist roadster with boutique manufacturing character. In the new edition, the R nineT once more features the laid-back elegance and proportions of a classic BMW roadster with its hallmark boxer engine, compact aluminium fuel tank with brushed side surfaces and a slim rear. And regardless of which variations the customer selects from the BMW Motorrad range of accessories – the R nineT always cuts a fine figure, whether with raised or lowered exhaust system, sporty aluminium hump or two-man seat. The deliberate reduction of the styling to the essential design elements of a classic motorcycle ensures that the new R nineT also stylishly expresses its character with a small number of carefully created components. From all angles, the R nineT continues to be defined by a blend of classic and modern elements of motorcycle design style combined with high-quality surfaces. Front section with newly designed circular instruments. The new R nineT also acquires a rustic expression of dynamic performance and supremacy from the classic circular instrument combined with the gold anodised tubes of the upside-down fork. While the instrument cluster previously comprised two circular instruments for speedometer and engine speed display, aesthetically integrated in this classic layout, the new design now features two separate instrument casings for an even more impressive appearance. In their simplicity, they entirely follow classic principles while still making use of modern technology. For example the R nineT also has an on-board computer as standard which provides a large and clear display on a segmented screen that shows the most important information such as time, active gear, remaining range, trip distance, service interval and average speed and fuel consumption. Attention to detail packaged in classic colours – optionally now also available with an individual paint finish ex works. As the founder of the BMW Motorrad Heritage world of experience, the R nineT made a striking impression from the outset with its exceptionally high standard of craftsmanship and its boutique manufacturing character. Nothing has changed in this regard in the new edition of the R nineT, so there are 3. Design and colour concept. Numerous details which fans will love: these include the 18-litre aluminium fuel tank with elaborately brushed side surfaces, the aluminium trim panel featuring an embossed R nineT inscription which runs across the air intake duct on the right-hand side and the fork bridges with conically tapered screw bosses. The latter – like the conically shaped mount for the steering damper and the footrest system – are aluminium forged parts with a blasted and subsequently clear anodised surface. The clamp for the double-butted aluminium tubular handlebars, also made of aluminium, bears the embossed BMW Motorrad inscription, and on the steering head the riveted type plate reminiscent of historical BMW motorcycles reflects the R nineT team’s fond attention to detail. While the R nineT previously conveyed its classic character in virtually perfect style with Blackstorm metallic combined with silver and metallic contrasts, the new R nineT nonetheless manages to go one better in this regard: to match components such as the frame and engine housing, which are painted black as before, the Paralever swinging arm and the housing of the rear-wheel drive are now also finished in black. This creates an even more authentic, classic appearance for the R nineT. For the first time, two individual paint finishes with boutique manufacturing character are available for the R nineT ex works as optional equipment items. In this way, BMW Motorrad has expanded the customising range to include the area of paintwork for the first time. The special paint finish “Blackstorm metallic / Vintage” makes every R nineT a unique specimen. The boutique manufacturing character of the aluminium fuel tank in Blackstorm metallic with hand-brushed side surfaces in clear gloss finish is reinforced with a yellow application bearing the start number “21”. The manually applied individual brushing gives this application a refined used look. The aluminium hump seat matching this special paint finish is included, and the passenger pad is supplied as standard. The second special paint finish available for selection is the individual design “Blueplanet metallic / Aluminium”. This colour variant is based on the handbrushed and clear finished aluminium fuel tank with ground weld seam and the likewise hand-brushed aluminium hump seat. The centre section of the fuel tank and hump seat are additionally finished in the colour Blueplanet metallic with a golden surround. Correspondingly, the front mudguard also features a finish in Blueplanet metallic. This colour scheme underscores the classic, refined character of the R nineT with a touch of fresh style. Here again, the passenger pad is supplied as standard. 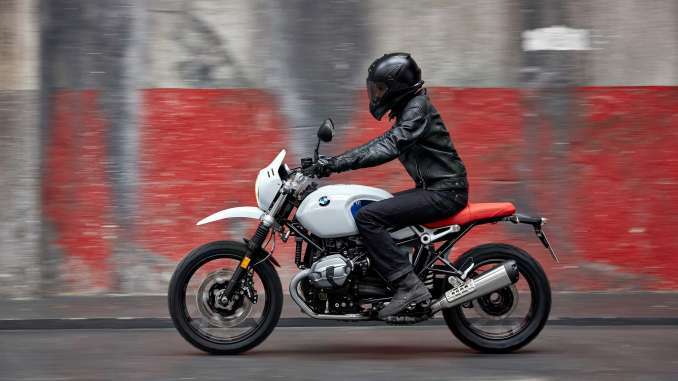 The R nineT Urban G/S: echoing the original, classic enduro feeling of a bygone era. BMW GS – a concept that has been an integral part of the motorcycling world for more than 35 years and has long come to be synonymous with a sense of freedom and the desire for adventure among both on-road and off-road fans on two wheels. The unparalleled career of BMW GS began in 1980 with the launch of the R 80 G/S. At the time it was not only the first large-series enduro with two cylinders, it also established itself as the first serial-production BMW with a single-sided rear swinging arm, the so-called BMW Monolever, later leading to the development of the BMW Paralever. The hallmark features of the 50 hp founder of the universal category of travel enduro bikes included its technical conception as being suitable for off-road riding but also its colour scheme. White was drawn from the palette of BMW Motorsport colours at the time, while the seat was finished in a striking bright red. The R nineT Urban G/S revives the traditional colour concept of the first R 80 G/S. A look at the R nineT Urban G/S reveals it to be the spitting image of its ancestor, and it reproduces the latter’s colour concept virtually without alteration. Just like more than 35 years ago, the fuel tank and the highpositioned front mudguard are finished in striking Lightwhite non-metallic, with a matching headlamp mask whose styling is geared entirely towards the BMW G/S style of that era. Like its role model, the R nineT Urban G/S features fuel tank decor in two tones of blue and a two-man seat in bright red – a colour combination that interprets the BMW Motorsport colours of former years. This echoing of past times is supported by a frame finished in black. The light alloy cast wheels and drivetrain are likewise finished in black. Slim, wiry and perfect for relaxed gliding along country roads or for light off-road excursions. With its narrow front silhouette combined with the classic circular headlamp and the headlamp mask, the R nineT Urban G/S has a look of agility, dynamic performance and supreme riding on many terrain types. Its wiry appearance is further reinforced by the narrow 19-inch front wheel and the light impression of the rear section. Harmoniously matching the headlamp mask, the instrument cluster consists of a speedometer designed as an analog circular instrument, indicator lamps and a two-line LCD screen which displays the most important information such as time and trip distance. Harmoniously created, high-end details in the R nineT Urban G/S, too. Like all models of the BMW Motorrad Heritage world of experience, the R nineT Urban G/S also benefits from harmoniously integrated and stylistically authentic details. Aluminium forged parts such as the fork bridges, the mount for the steering damper and the clamp for the double-butted aluminium tubular handlebars with embossed BMW Motorrad inscription convey a high degree of high-end quality, for example. The dual-section front mudguard features another interesting detail solution. The front splash guard is mounted on the lower fork bridge and therefore high above the front wheel, thereby skilfully highlighting the classic BMW enduro style of the R nineT Urban G/S. The rear splash guard is mounted just above the front wheel and bolted to the slider tubes via a fork stabiliser.